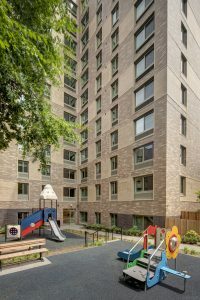 Alan Bell, Principal of B&B Urban and a founding principal of The Hudson Companies, Inc., is a leader in New York affordable and supportive housing development. Alan has built over 6,600 units of new housing in 50 separate developments, including approximately 2,500 units of affordable housing, in his 40+ year career. 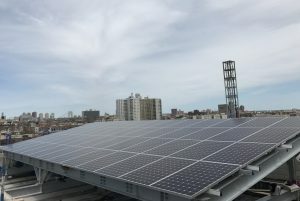 He has worked with Bright Power for several years, integrating solar PV and energy efficiency into most of his new developments such as at Dumont Green, Gateway Estates, East 162nd Street Court, and the Kingsbridge Heights Apartments. In this two-part interview, you’ll learn about Alan’s experience, his commitment to providing long-term affordable homes, and what drove him to become a proponent of solar and energy efficiency. We’ll post the second part next week. Bright Power: With your decades of experience, what originally attracted you to the affordable housing development industry? Alan: I’m urban-oriented and I believe that well-functioning, lively cities are vital to the democracy of America. I was attracted to affordable housing early on being born and raised in Philadelphia. I felt like I had seen the decline of Philly and thought I should do something about our neglected, failing, and collapsing cities. I’ve been working in the affordable housing space for a long time. You could say 48 years. It all began when I was a student at Columbia in the summer of 1970. We organized residents living in the Manhattan Valley neighborhood to take over some vacant buildings. The 1970s were very different from today. It’s hard sitting in New York now to really appreciate what New York was like back then. My first job out of college was with HDA—the forerunner of HPD—where I worked in the office of coop conversion. The city lent money to low-income tenants to purchase the buildings outright and then turn them into cooperatives. I later ran the city’s sweat equity program where tenants contributed their own labor to reduce project costs by partly renovating their building themselves. From there, I went off to MIT [for a Masters in Urban Studies and Planning] before coming right back to New York. I worked for the City’s Office of Management and Budget and then the City’s Office of Economic Development.. I ended up running the city’s UDAG (Urban Development Action Grant)* program when Carter was president. We financed quite a number of things over those years—everything from The Studio Museum in Harlem to the Marriott Marquis Times Square Hotel to The Joyce Theater in Chelsea. After a stint in finance on Wall Street at the firm DLJ, and later Bankers Trust, I got the opportunity to go into business with Nick Lembo and Bill Fowler in 1986 and together we created The Hudson Companies. Affordable housing kept us going through the early to late 90s when we started to do market rate projects as well. We consistently tried to balance doing both affordable and market-rate developments in 4 of the 5 boroughs of New York City (Staten Island seemed like foreign territory). And we also tried to balance both house and condo sale projects in order to provide cash flow and investment funds with rental developments to build up our balance sheet. Affordable housing continued to be a part of my life even after I left Hudson Companies. Make no bones about it, I was very interested in seeing if I could do market rate luxury housing. We developed the luxury J Condominium, which, at the time, briefly, was the tallest residential market rate building in Brooklyn. And that was it. I proved it to myself that I could do luxury but, ultimately, that’s not where my interests lie. *The Urban Development Action Grant program, run by the Department of Housing and Urban Development, provided $2.7 billion to eligible distressed metropolitan communities to assist them in alleviating physical and economic deterioration. Bright Power: You’ve also added supportive housing to your focus. Tell us more. Alan: At B&B Urban, my wife and I find it important to focus on providing supportive housing to families and youths. Historically in New York, there have been many programs to address the needs of individuals suffering from mental illness, HIV/AIDs, and substance abuse problems. But you have to look at the current shelter system to understand that it’s a family problem now. Kids are the innocent victims here and stable housing is an important determinant of mental health and academic progress. Proximity to jobs, public transit, retail, and other services can help resolve the geographic determinants of health and well-being. This is why we have tried so hard to move quickly to acquire the sites with these characteristics for our developments over the last seven years. Bright Power: For as long as we have been working together, you always prioritized incorporating solar PV and energy efficiency design features into your developments. What originally led you to this approach? Alan: I jumped on the solar bandwagon pretty early on. I made sure every single one of my projects had a solar array. Why? First, I know solar is where we are going as a country and globally. Second, for affordable housing and real estate in general, it’s about risk management. One of the things you can attempt to control are operating costs. The greatest threat to the long-term viability of affordable housing is the fact that operating costs can rise more than incomes. I see solar as an opportunity to reduce my risk and manage long-term operating costs. Solar and energy efficiency go right to the bottom line and also can act as a cushion against unintended cost increases for labor or insurance. Not to mention that NYSERDA had a great incentive program and we could finance solar into project budgets. Back in the day, the first deal I did you had to deduct the cost basis for the solar from the LIHTC calculation. But once that law changed, you just had to deduct 50% of the solar install from your LIHTC basis. And ever since then, I’ve been doing solar projects. I am nothing but happy about solar. And it’s gotten better. The panels and technology have improved and have become more efficient. I push for it all the time and think solar is worthy of a lot of attention. Solar and efficiency just make sense to me. I have traditionally used the tilted plane and steel dunnage installations in order to minimize roof penetrations. I am warming up to the ballasted system, maybe not as efficient but less costly without all that steel, so it has its benefits. For me, there’s no ambiguity about reducing energy costs with solar or efficiency. It’s good for everyone—the environment, the city, as well as long and short-term operating costs. 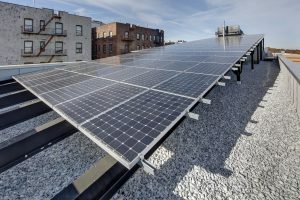 Bright Power: When you think about sustainability and clean energy adoption across the entire real estate industry, why do you think the affordable housing sector is a leader? Alan: For affordable housing, sustainability is very much a part of the risk profile. There’s a big difference in terms of risk with affordable housing than there is with market rate housing. A market rate landlord or condominium developer has to worry about renting or selling his development at numbers that work. 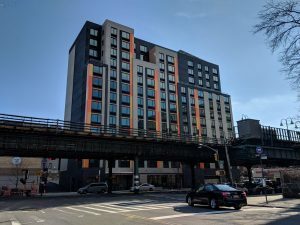 With affordable housing in New York, where we have an infinite demand for units at affordable rents and future increases in rents are capped, it’s really the long-term costs of the building that are the largest risk element. So it’s natural for affordable owners to be the leader in energy efficiency. The retail housing consumer may profess an interest in sustainability or clean energy but when it comes to dollars and cents they somewhat ignore it. You’d be amazed at people that buy condos and don’t ask questions about their HVAC systems or know how efficient their building is, but rather focus on fixtures and finishes. It would be like buying a car without knowing the mileage. For the biggest purchase of your life perhaps, you’d think people would be more focused on energy efficiency, at least on the condo side. On the rental side, there are some—but not all—landlords who are very concerned about lowering their energy bill and operating costs like we are for affordable. It’s always the first cost problem. It’s very hard to make your numbers work from the beginning. You spend too much on the land, your construction costs are more than you thought they’d be, and then certain things suffer. So getting your project to come in on budget dominates over long-term costs. Stay tuned for the second part of our interview with Alan Bell next week!